Here at Vaughan Metropolitan Centre, the northernmost TTC station, I have finally covered all seventy-five stops on Toronto’s four subway lines. 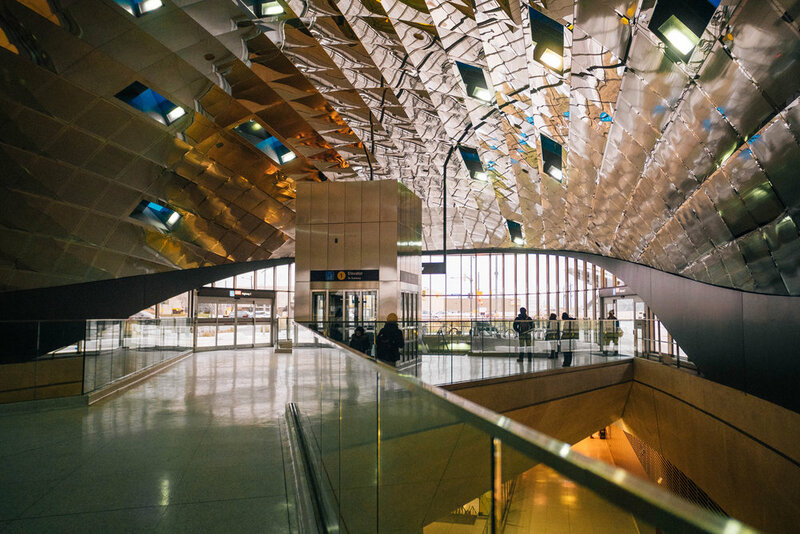 Also, in a strange coincidence, the date I’m publishing this is the one-year anniversary of when this station (as well as the rest of the Line 1 extension) was opened to the public. Two small structures reminiscent of turtle shells are the only footprints this station leaves above ground (although there is a similarly shaped connecting bus terminal nearby). The curves of the entrance continue downward as the station widens in the lower levels. 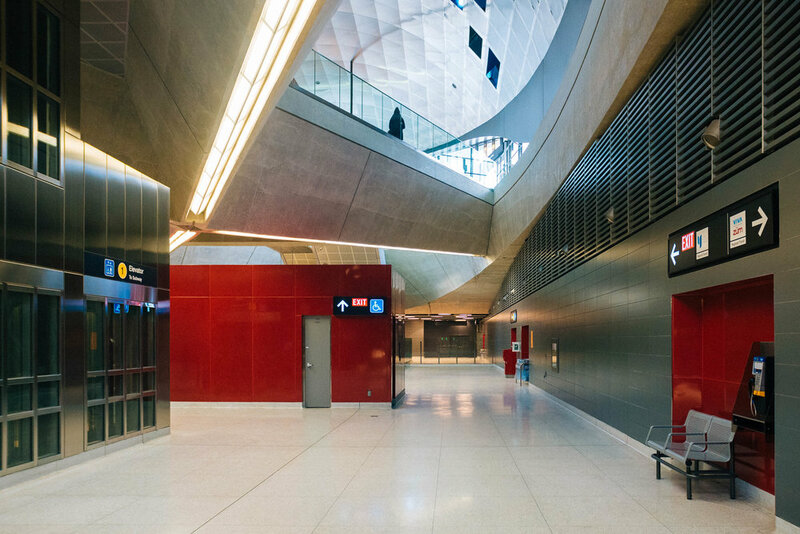 The lower levels feel like they have a no-nonsense design, especially in comparison to the other new stations — muted colours with red accents to highlight where to find benches, trash cans, and the fare gate. You won’t find too many people using this station — it’s a representative for future passengers, waiting for the area around it to grow. A recent Toronto Star article talks about how, with the exception of York University station, the new stations are some of the least used in the TTC system. I took a brief walk around the area outside of the station, and it’s clear that the area is quickly being built-up, with more people to come. In fact, the entire area is part of a plan to develop “downtown“ Vaughan to accommodate an additional 25,000 residents. While ridership is low now, it seems likely to increase as areas north of the GTA grow. Timing has not always been the TTC’s strong suit. So, what’s next? Work is currently in progress on the Eglinton Crosstown LRT, aka “Line 5“, which is estimated to be open in 2022 or 2023. A cross-between subway and streetcar, the train will go through an outdoor priority lane along Eglinton Ave East, as well as underground stations as it travels westward. You can already see mock-ups off all of the stations on the Crosstown website — who needs photos five years from now when you can have mock-ups now? This whole project has been a nice photography exercise for me — a way to explore the city and work on my photography skills in the background of other work and projects. Since I started with my first post for Kipling station just over two years ago, I’ve been able to travel and use transit systems in cities across Europe and Asia. Is the TTC the best system in the world? Certainly not, but I’ve seen worse. What I can say is that while the system as a whole may have problems, through public art projects and creative designs, it’s hard to find a bland TTC station. Even if you don’t exit the station, the structure will tell you something about its connection to the neighbourhood — that’s something that I haven’t seen elsewhere. So here at the northernmost station, outside of the city, I hope that these photos have helped to show the connections that these lines give to the people in and around Toronto.